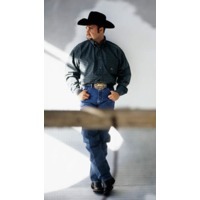 Daryle Bruce Singletary (born March 10, 1971 in Cairo, Georgia) is an American country music singer. Signed to Giant Records in 1995, he released his self-titled debut album that year. This album produced four hits on the Billboard country charts, including the #2 "I Let Her Lie" and #4 "Too Much Fun". Although his second album (1996's All Because of You) produced another #2 in "Amen Kind of Love", its second and third singles failed to make Top 40. A third album for Giant, 1998's Ain't It the Truth, was released before Singletary exited Giant's roster. In 2000, Singletary switched to Audium Entertainment, where he released the albums Now and Again (2000) and That's Why I Sing This Way (2002), both of which were largely composed of cover songs. A third album of covers, 2007's Straight from the Heart, was issued on the independent Shanachie label.